Terrific idea. 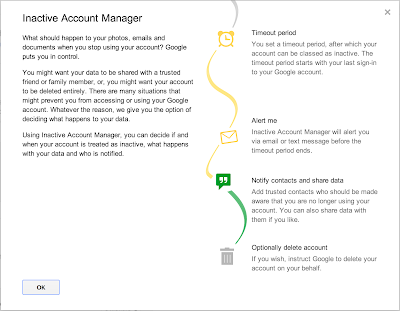 I know a lot of peoples entire digital lives are tied to their Google account. Having control of what happens to this account if your either die or are otherwise incapacitated an eminently sensible feature. I would not want to be a programmer involved with this. The thought of causing a bug in the system tripping a dead man's switch would keep me up at night. One would kind of hope it's somewhat tied into the backup/replication system so that it's not possible to instant-delete any user data. Either way, I'd imagine there'd have been lots and lots of tests for this system.